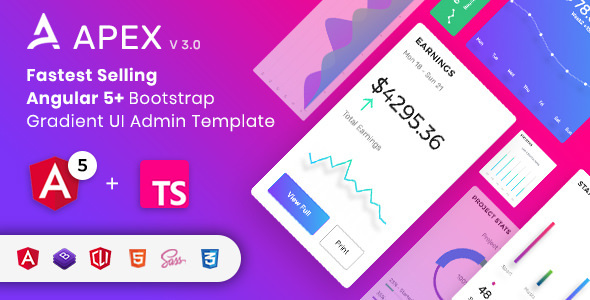 Apex admin is super flexible, powerful, clean, modern & responsive admin template based on Angular 5+ and bootstrap 4 beta with unlimited possibilities. The Angular CLI makes it easy to maintain this application that already works, right out of the box. It includes 7 solid & 7 gradient menu color options and 3 different sizes with organized folder structure, clean & commented code, 100+ pages, 500+ components, 50+ charts, 50+ advance cards (widgets) and many more. The code is super easy to understand and it comes with starter kit which will help developers to get started quickly. The template is fully responsive and clean on every device and on every modern browser. Apex admin contains many example pages with many ready to use elements and easy to customize. You can choose from few premade layouts. This template comes with lots of popular UI components with a unified color scheme.